Východoslovenská oblasť There is 1 product. When you orders above 50 €, you have free shipping. If you have questions for us or need advice while shopping, please contact us. Unless you own discount vouchers take advantage of it when shopping and get the appropriate discount. “Life is too short to drink bad wines." We offer quality wines directly from producers from Slovakia, France, Germany, Italy, Montenegro, Argentina, Chile and New Zealand. 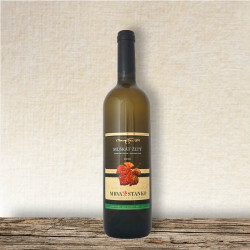 All foreign wines are on the Slovak market for exclusive and you will not find them in any of the chain stores. With our wines, you may encounter at some restaurants, hotels and wine shops. Súhlasím som zasielaním obchodných informácií a noviniek. Svoj súhlas môžem kedykoľvek odvolať. Viac o ochrane osobných údajov. © 2014 - 2019 TOP VINO. All Rights Reserved.